Johnson & Johnson has had a great year largely because of its hepatitis C drug Olysio. 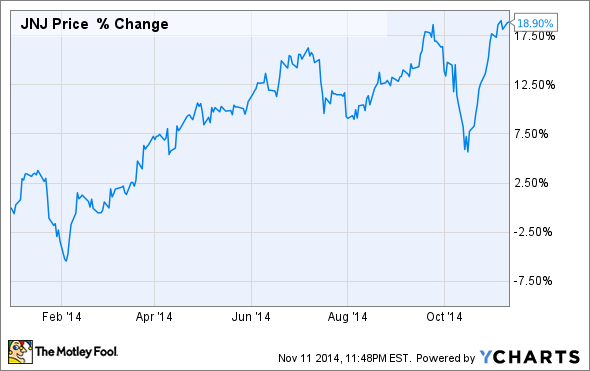 This top dividend stock, though, might reverse course in 2015. Here's why. As the healthcare sector rolls through its third-quarter earnings, a bucolic picture is coming into focus. Earnings across the sector are soaring due to new drug launches, a frenzy of acquisitions, and vast reorganizations that have helped to stem the tide from the ongoing patent cliff. So it's unsurprising that many top names like AbbVie (NYSE:ABBV), Celgene Corp., and Johnson & Johnson (NYSE:JNJ) are presently trading right on the razor's edge of their 52-week highs, and threatening to push higher still. Specifically, industry experts have J&J shares currently trading at a reasonable forward price-to-earnings ratio of 17.55. And when factoring in the company's healthy dividend yield of 2.57%, J&J looks like a compelling buy, even near its 52-week highs. A look under J&J's proverbial hood, though, strongly suggests that a trend reversal may be right around the corner. With that in mind, here are three reasons why J&J stock could falter in 2015. As I've discussed previously, J&J's growth story has centered largely around two drugs, Olysio for hepatitis C and its advanced prostate cancer drug Zytiga. Per the third quarter, Olysio composed nearly 10% of all pharma sales, and drove a whopping 63% of total growth within this critical business segment. The recent approval of Gilead Sciences' (NASDAQ:GILD) once-daily, fixed-combo pill Harvoni, though, should wipe out nearly all of Olysio's sales, according to experts. In anticipation of Harvoni, J&J's research partners have been working diligently on testing a combo of Olysio and Sovaldi, resulting in a regulatory approval with the Food and Drug Administration earlier this month. Despite this regulatory "win," J&J will probably remain on the outside looking in when it comes to the hepatitis C market, though, due to pricing. At the end of the day, J&J doesn't control Sovaldi's price, meaning that its newly approved combo will probably cost significantly more than either Harvoni or AbbVie's anticipated triple-drug regimen. Zytiga sales will therefore need to pick up the slack, if J&J is to continue its monster run. The problem is that Zytiga sales are starting to show signs of flattening out. In the third quarter, for example, the drug posted its "weakest" amount of year-over-year growth to date, namely 36.5%. While 36.5% in annual growth shouldn't be taken lightly, it does represent around a 10% drop from prior quarters. In the first and second quarters, Zytiga sales posted 48.8% and 45.5% annual growth, respectively. Put simply, the drug's growth trajectory is starting to slow down, making it unlikely that Zytiga can offset the huge loss of Olysio sales in a meaningful way. Like most healthcare companies, J&J has problems associated with seasonality due to complex payer reimbursement schemes. The result is that key drugs like Remicade and Zytiga tend to see huge sales dips during the first quarter of the year, compared to the fourth. If this trend holds up, and there is little reason to believe otherwise, J&J is on track to post negative growth within its pharmaceutical segment in the first quarter of next year, assuming Olysio doesn't somehow pull off a miracle. Put simply, I think J&J's record of consecutive quarterly growth in pharma could come to an end in the first-quarter of 2015. Is it time to take profits on Johnson & Johnson? I think there are two schools of thought that can be tapped to answer this question. On the one hand, J&J has a long track record of increasing dividends, share buybacks, and bringing innovative new products into the fold. Viewed this way, J&J looks like a hold -- in spite of these headwinds. On the flip side, J&J has become overly reliant on its pharma segment to generate growth on the top and bottom lines. Its consumer and medical device segments have essentially been flat in the past few quarters, and this isn't a trend that is expected to change soon. If drug sales dip as expected, J&J's stock could come under immense pressure after a lengthy and marked rise. My take is that J&J will be fine over the long term, but it isn't a compelling buy at these levels for the reasons outlined above. In short, I think this dividend stock has topped out for the time being. Going forward, I won't be a J&J buyer until the stock sheds a fair amount of this year's gains, or another major revenue driver comes into play.